truth be told, i'm running low on new blogging ideas. i'm designing two wedding invitation suites and am in the midst of two book layouts, so all my creative juices are currently at full capacity elsewhere. but you know i love blogging about blogging. so i had an idea. why not let you in on some personal emails i've been exchanging? lately i've been answering emails from awesome people. (do you have a question for me? shoot it my way.) in this post you'll find my two cents (and then some) on helping a certain someone give more genuine personality to their design-ey / professional blog. ...now, please know that i really, truly LOVE and adore your blog AS IS. i think it's clean and cohesive and fabulous in every way. your photos are amazing and your work and style really stand out. i can tell you are an amazing designer without knowing what you had for lunch or what is hanging on your walls or if you've branched out to neon skinny jeans. tip #1. you'll have to decide what boundaries you want to create for yourself. how much of yourself and family will you share? will you call them by name? post pictures? it's important to decide what you will and will not share openly on the internet. it's a big deal and you should be careful about what you do and don't post. decide what works for you! my most open-hearted posts are usually read by dan first because i care about his opinion. tip #5. seek out inspiration for blogging and make lists! i know you love lists. so when a good idea comes for blogging, make a stockpile of potential posts. this is much harder to do as a personal blogger, but once you start thinking seriously about what kind of posts will matter to you (and are worth your time! ), more ideas will grow. and one more thing, do not focus on stats or the total number of comments you get every day. 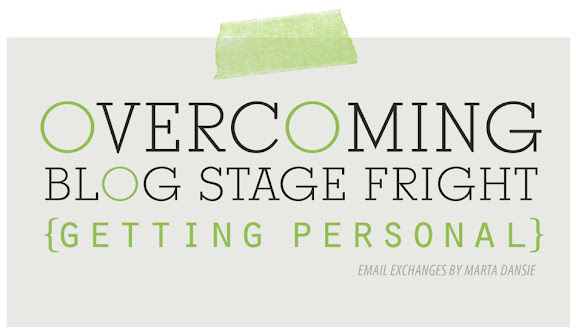 this will absolutely kill your blogging spirit. another source of inspiration is your google reader! check out your favorite blogs and ask yourself specifically what you like about their blogs. what about those blogs keep you coming back for more? see if you can implement some of those elements in your own way to rev up your blog writing. bonus tip. don't think about it too hard. blogging ought to be fun. whenever a writer dissects their writing–revising and editing it to death–it loses its authentic light. let your words be. let them have the spotlight. especially with blogging. this is an amazing forum where writers get to publish their rough drafts to the world. don't be too critical and try hard not to doubt yourself. confidence only grows when we use it; be bold. Love your tips Marta...and I for one would love stopping by just for THIS!!! You giving me a PEP talk about blogging and how I'm not being too "out there cuz I do it" or too "lookey..lookey"...I have found that blogging has given me a whole new perspective about myself, my art....AND a wee bit of confidence when I talk about myself in real life...being one to lean toward the listening spectrum more in person....I just find that blogging has made me a more INTERESTING person. Seriously...I'd love to sse a blogging tips weekly segment spring up from you!! Cuz we are all so new to it! super helpful. my favorite is tip #3. i have a hard time with that one. Love love love these tips, thanks so much for sharing! This is really great, thank you! I'm not in the business of blogging, but I blog because I'm a would-be writer and love to express my life that way. However, when it comes to the hard stuff, I find it difficult to publish. At the encouragement of family and friends I posted some stories about infertility and our IVF journey, it felt good, but I made sure I was in Australia when then published so I was removed from it. thanks for this, marta. you're awesome - i definitely don't tell you enough how much i enjoy reading your blog! I really appreciate your post! It is just what I needed to hear. Marta, thanks so much for this encouragement. I really appreciate tip #4 on not needing to be an expert and the bonus tip about not thinking about it too hard. Naturally, I want every word and photo and idea on my blog to be AMAZING. Witty prose! Natural light! Pin-worthy content! And then far too often I end up overthinking so much that I don't post anything at all because I know it won't live up to my impossibly high standards. This is a great list! Thank you for sharing. I definitely liked your thought about getting over being narcissistic. It's hard to believe sometimes that people want to keep coming back to hear about your thoughts and your life, but I always love hearing about others so I just need to get over it! Thank you so much Marta. I'm currently struggling with my own blog. I've hardly posted anything on it for this very reason: I can't seem to find that balance between professional and personal. I love your blog so much because you do this so well. I agree with every word. There is so much power in truth and being authentic. This is coming from someone whose blog is 99% fluff. But I get the most comments and meaningful comments on my few deep posts..like my divorce stuff. I love all your tips. I love what you said about blogging what's important to you in the moment. Last week I had a TON of ideas and I should've put it all down and made a zillion posts while I was feeling the passion for it, but now, my mind is kinda blank. I need to work harder at capitalizing on the inspiration I get WHEN I get it. Hi Marta, great tips! Maybe they should be "The 5 Commandments of Blogging!" Esp #4 about "not bragging" ... I have stopped reading some blogs because I just got the feeling she is saying: "oh look, this is so great, I'm so great, my kids are so great" and it was annoying and obnoxious. I ENJOY your blog, and never get the feeling that you are bragging, althought everything you write and photograph is worth bragging about! No matter what you write, even on days when you admit you are low on ideas, it always turns out to be interesting, or heart-warming, or pretty, or inspiring! Keep up the good work! Love and appreciate this post, Marta. Love this post, Marta. Amen to all of it. Love reading your beautiful blog voice lately! I continue to visit your blog because your voice comes from such a kind and thoughtful place, such humility. There are some blogs that actually make me feel bad about myself because they can feel to me like they are "the popular girl" and telling you what we should wear, do, eat. I agree that what is most compelling is hearing what someone is actually feeling, thinking, experiencing. We are endlessly curious about what goes on inside other people's homes and heads, aren't we? I try to remind myself of that when I wonder why I'm blogging: that it is a gift to me to hear from others, like you, and hope that maybe there is even one person out there that gets that from mine. Not to mention that you get to have an online "scrapbook" of the important parts of your life to go back to. Thanks, Marta, for being such a generous presence here on the internet! love, love, love this post. thank you for sharing your email correspondence with us... this is a post i'll come back to for sure. Wonderful tips. I really like your reminder that we shouldn't focus on the number of comments or the stats. I have been disheartened sometimes when I've looked at them. I also would like to get more personal and share the "stories" of life more. I love your blog. I am a newbie to your site. Thanks for the info! i like this post! I'm trying to figure out more of the direction of my blog & how to write good posts, so you're tips are helpful mart! Thank you! Thank you! Thank you! I very recently started my blog and have been putting my feelers out there for helpful pointers to help with the process. This was just what i needed. I have already been worrying about not having followers, that graph thing a ma jig, etc. These words have served as the reminder that i needed. thank you!